I couldn’t decide who this chapter belongs to more. It ought naturally be Meng Jue, but Ling gege just about broke my heart with the last line of this chapter, so both of them get to top this post. It’s double the pretty, so no one ought to complain. For all of you asking when Yun Ge will (finally) meet her Ling gege (the real one, not the guy she thinks is her Ling gege), it would have to wait until volume 2. Yes, I know, Tong Hua is evil. But then she makes volume 1 the Meng Jue story, and his many shades of white, black, and grey are so fascinating the story just keeps on going without or without Ling gege taking center stage. This chapter is AMAZING, and ups the emotional stakes one giant step forward. That is all I have to say. We’ve got lunar rainbows, piggybacking (OMG, I swear I swooned), singing, and then all of that combined into a heady moment involving all three leads, though not necessarily crossing paths. 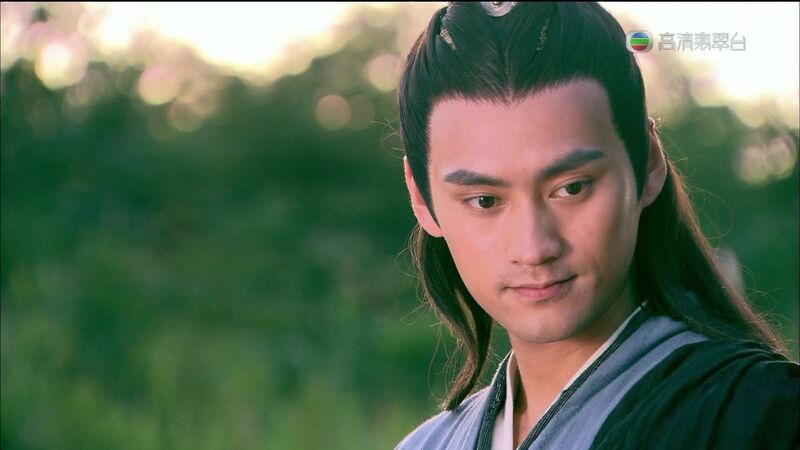 Sigh, Yun Zhong Ge is just so lovely it takes my breath away. Since Meng Jue appeared, he acted calm and composed, no sign that he was upset or anxious earlier. Because of what Huo Cheng Jun just said, Yun Ge noticed for the first time that his hair was mussed and there were stray leaves on his robe. He was clearly in such a rush to get down he wasn’t even concerned with where he was going. Yun Ge couldn’t describe what she felt. If he wasn’t interested then he shouldn’t come bother her, then she wouldn’t be affected by his pull close and then push away attitude. Liu He was all eager to watch the love rivals Yun Ge and Huo Cheng Jun start a cat fight, and see how Xiao Jue handled it. Who knew Yun Ge would suddenly act like she wasn’t involved at all. Liu He shook his head and jumped on his horse “Booooring! Back to hunting!” He was off faster than his words were said, disappearing into the woods. Xu Ping Jun whispered “Yun Ge, Meng dage had reasons for doing what he did. If a lie can save a life, you would do it as well, right? If you were captured, then Da Gong Zhi would be in trouble. You might not be an assassin, but what about Da Gong Zhi? 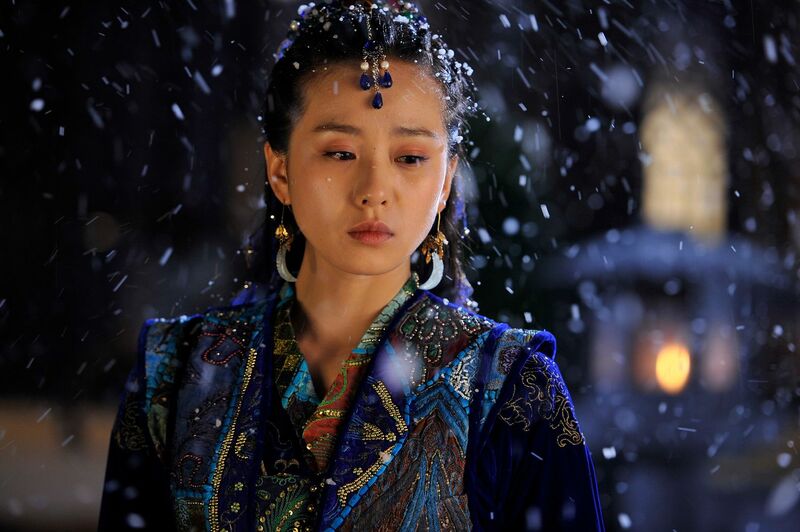 He’s a royal, and with one misstep entire families have been killed before.” Yun Ge opened her eyes and then turned to look back. They had already gone quite a ways, but for some reason Huo Cheng Jun and Meng Jue were still standing in the same place. Yun Ge was wondering why when suddenly she saw Huo Cheng Jun try to slap Meng Jue across the face. Meng Jue grabbed her hand and she tried to pull it out. She then quickly jumped on her horse and took off. Meng Jue didn’t chase her, still standing in the same spot. Yun Ge didn’t understand and she stared at Meng Jue. How could he allow Huo Cheng Jun to get mad? Why didn’t he chase her? She was thinking in a daze when suddenly Meng Jue turned and looked towards Yun Ge’s direction. Despite the winding mountain roads, Yun Ge felt her heart lurch and she quickly turned around, afraid to look anymore. When they returned to the residence, the Princess was already alerted. Fu Su’s life wasn’t in any danger but he was still unconscious. The Princess could only ask Yun Ge and Xu Ping Jun what happened. Yun Ge could not kneel because her leg was bitten and the Princess allowed them to sit when responding. Yun Ge explained what happened, that they had inadvertently run into the Infante of Guang Ling, who released his hunting hounds on them. She emphasized how loyal Fu Su was to the Princess, using his life to save them. Yun Ge finally casually explained how the Infante of Chang Yi happened to arrive and saved them. The royal physician checked Yun Ge and Xu Ping Jun’s injuries and prescribed some medicine, telling them to rest and not move around much. It was night time by the time they drank the medicine. Yun Ge laid on the pallet and stared at the ceiling. Hong Yi nodded and wiped her hands before promptly leaving. Meng Jue said nothing, just taking a wine cup from Liu He and pouring himself a cup and drinking it. Liu He just grinned at Meng Jue, who silently sat there drinking. 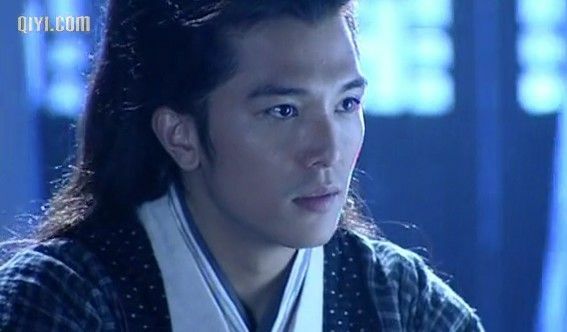 Liu He continued to look outside, his expression cold “Today is the anniversary of the death of our Second Brother. If you want to hit me, then go ahead. After today I will fight back. Your half-assed martial arts can’t hope to compete with me.” Meng Jue sat there quietly and kept drinking cup after cup of wine. When he saw Hong Yi poke her head in, he wordlessly got up and walked out. Liu He took the entire bottle of wine and just drank it directly from the bottle. To allow him to put on medicine, Yun Ge’s entire calf was revealed. When Meng Jue was putting on medicine, his one hand held Yun Ge’s wrist and the other was lightly rubbing the medicine into her wound. Yun Ge tried to remind herself that he was just a doctor treating her and this is nothing. But her face still turned bright red and she didn’t have the courage to look at Meng Jue, only staring at the ceiling. “Why didn’t you come ask me for help.” Yun Ge was silent and then mumbled “Didn’t you just leave that day without even looking back. I didn’t you see you after that. Who knows where you went with other sisters of yours.” Meng Jue finished wrapping Yun Ge’s wound and fixed her clothes before sitting down next to her. This was the first time Meng Jue has almost completely expressed his interest in Yun Ge, without his previous evasiveness. Yun Ge’s face turned bright red but she couldn’t contain her smile. After some time, she asked “Who did you come with today? The Princess? The Infante of Yen? Or…….” Yun Ge’s voice trailed off. Meng Jue looked at Yun Ge and then helped her up and sat with his back to her “Get on.” Yun Ge hesitated but then docilely climbed on Meng Jue’s back. Meng Jue carried her on his back out of the courtyard, following the moon and walking into the mountain canyons. A round moon was shining over the entire mountain. The sound of cicadas blanketed nature and there were fireflies that flitted here and there occasionally. On one side of the slope grew green verdant grass. Looking down from the hills, the dew from the grass glistened in the moonlight and reflected back so that it appeared a shattered Milky Way had fallen. Following Meng Jue’s footsteps, Yun Ge felt like she was walking in the galaxy as well. Yun Ge couldn’t make a single sound, afraid that she would disrupt this beauty. She didn’t know how long they had been walking in the canyons until she suddenly heard the sound of rushing water. Yun Ge’s heart leapt, the waterfall she was intending to see during the day before she was bitten, tonight someone brought her to see it. When the rushing water of the waterfall came into sight, Yun Ge gasped out loud and Meng Jue’s footsteps slowed. Right now the sky was a dark blue night and the round moon was high in the middle of the sky. The canyons were not completely visible but a white streak come flying down and shattering on the rocks, spraying droplets of water everywhere. Meng Jue put Yun Ge down and they stood before the waterfall, quietly admiring the rare sight of a lunar rainbow. “I didn’t meet my adoptive father yet at that time, so I didn’t know about the desert mirages.” Yun Ge’s heart lurched, thinking about how close to death Meng Jue must’ve been. Seeing the Meng Jue of today, his gestures, his conversations, Yun Ge could not imagine he could be the young boy he was describing. Meng Jue’s tone of voice was so casual it was like what happened didn’t happen to him, making Yun Ge ache even more to hear this. Meng Jue smiled and looked at the lunar rainbow, as if recollecting the past, his expression one of tenderness. At the brink of death, to have another person take care of you without giving up, that is a type of happiness and a type of luck. Even in the darkest despair, it still feels warm. “Later? 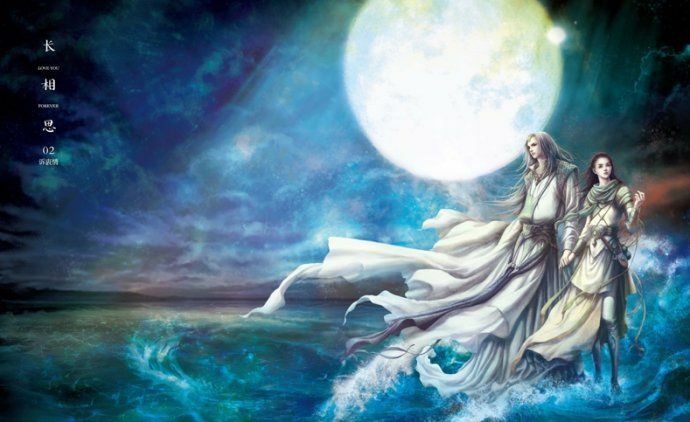 What happened to your Second Brother?” Meng Jue silently looked the lunar rainbow before saying “Later, when I found him again, he was already dead.” Yun Ge respectfully bowed to the lunar rainbow. When she straightened, she wobbled because of her injured leg and Meng Jue grabbed her arm to steady her. To Yun Ge, Meng Jue was always close yet so far away. Sometimes he sat next to her but Yun Ge felt his heart was far away. The lunar rainbow in front of them was curving like a bridge, almost like it was leading the way to happiness. If they took one step and followed the rainbow, they might be able to walk to the happiness at the end. At this time, Meng Jue’s dark eyes were staring at Yun Ge. She knew that Meng Jue had already taken the first step. Yun Ge reached out and held his hand. His fingers were cold, but Yun Ge’s hand was warm. Meng Jue slowly grasped Yun Ge’s hand. What was a really terrible day changed now all because of one person. Yun Ge’s heart was like the rainbow under the moonlight, glowing its seven different colors. Meng Jue smiled and said “It’s a lovely song. Since we are far from the Gan Quan Palace, you can sing louder.” That was when Yun Ge realized that she had been humming a song. Yun Ge startled…..how did she end up humming that particular song? Meng Jue asked with a smile “What is it? 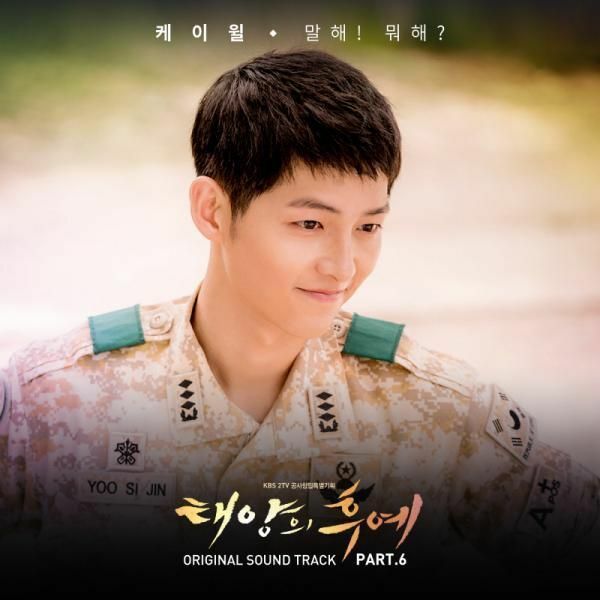 You’re not willing to sing for me?” Yun Ge smiled and shook her head, then began to sing. Meng Jue realized for the first time that Yun Ge’s voice was beautiful. It was clear and melodic, lilting and smooth. It sounded like the song that came drifting from the clouds. Her voice wasn’t loud, but in the silence of the forest, with the warm breeze of the wind, it traveled far and wide. It floated over the grassy plains, danced over the canyons, drifted over the tops of the trees, arriving at the edge of the mountain roads………..
Liu Fu Ling appeared not to hear a word Yu An said, only focusing all his attention on listening to the singing and then taking giant steps towards the direction where it was coming from. Yu An and the rest of the eunuchs could only follow Liu Fu Ling as he listened and walked. The singing in the wind came and went, ephemeral and hard to distinguish so that even the sound of walking could muffle it. But to Liu Fu Ling, this was a song he knew in his heart. No matter how soft the voice, if she was singing it, then he would be able to hear it. “Be quiet.” Liu Fu Ling was listening to the singing and running ahead, paying no attention to what was happening to him. Yu An was cursing that unknown singer, and perhaps the Heavens heard his curse, because the singing suddenly stopped. Liu Fu Ling stood in place in disbelief. He tried to listen, but there was no more sound anymore. He rushed ahead hoping to capture anything remaining in the wind, but there was nothing. “All of you pay attention and listen carefully.” Liu Fu Ling anxiously ordered everyone around him. Yu An and the other eunuchs strained to listen but all shook their heads indicating they could hear nothing. Liu Fu Ling tried to run to a higher place to look around carefully, but all he could see was empty dark night. The silence was so silent it was gentle, and yet so silent it was cruel. “Take people along the direction you estimated and investigate.” After ordering the only thing he could do, Liu Fu Ling remained standing in place, looking forlornly at the sky. The stars are silent, the wind had no shape. In the vast world, only he stands at the top of the mountain. Can the full moon reunite people? Even Chang Eh the goddess could only dance alone in the moon, how could she even worry about the gatherings and partings of the people below. Liu Fu Ling stood there not moving, so no one around him dared to move. 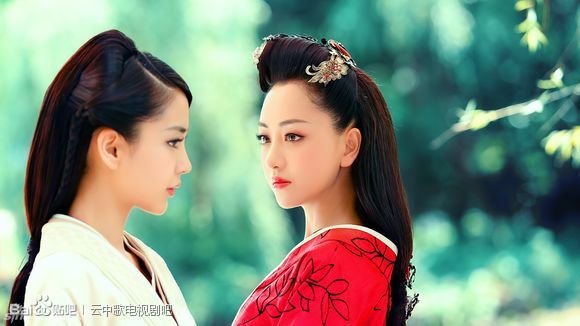 Yu An tried to call “Your majesty” twice, but seeing Liu Fu Ling make no move, he also grew silent. After a long time, Liu Fu Ling silently turned and walked back the direction they came. His figure under the moonlight was straight and strong, yet it seemed so lonely. Yu An followed behind Liu Fu Ling and then suddenly slapped himself hard “Your majesty, the singer must be close to the Gan Quan Mountain area. I can order soldiers here to seal the mountain and then ask every single person, we’ll find the person.” Liu Fu Ling glanced at Yu An and then kept walking ahead without stopping. Yu An slapped himself “Your servant I am an idiot.” If they made such a big deal, no one would believe they were just looking for a singer, especially not those three Infante Dukes. Plus Huo Guang and Shang Guan Jie and Xang Hong Yang. Chances are the three nervous Infante Dukes would launch a rebellion before the Emperor could find his singer. Liu Fu Ling got in the carriage but his eyes were still staring outside. There was no song, there was nothing! Only the sound of the horse hoofs and the carriage reverberating in the canyons. Yun Ge, was that you? If it was you, and you are so close to Chang An, why haven’t you come to find me? If it wasn’t you, then why does it sound so familiar? Yun Ge, tonight, for whom did you sing? Finally, MJ let’s YG know his feelings! about time. I checked online and Volume 1 has 18 chapters.. so 5 more chapters until Volume 2. How suspenseful..
Now off to read… and thank you so much, Koala! I appreciate your dedication and hard work. Have a happy/safe travels! Ahhh…what a sweet and touching moment between Yun Ge and Meng Jue. I loved how Yun Ge said that for the first time she felt that Meng Jue is finally standing and present next to her. This perfect and wounded boy who kept himself apart finally let his guard down. And the piggyback across the fields…so, so beautiful. How can Tong Hua write with this much beauty and heartache at the same time? 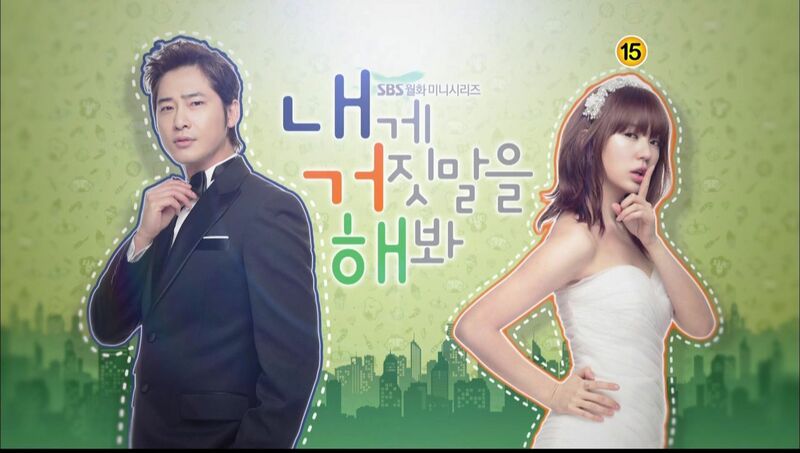 Love the moment between MJ n YG! Sometimes just sayin nth,says a lot. . .n LFL watever relate to YG it lure him to it. . .wot will happen when they’ll meet. . .O God I want this novel so bad. . . .why why why, writer didn’t publish in english too! Koala can’t describe in words tht how much i’m greatful to ur translation. . .day n nite i’m always waitin for the recap. . .i’m soo addict to it. . .despite being bg u make time for recap means a lot to me Koala THANKS AGAIN. Hope to see another recap soon! omg I totally agree with you about how Liu Fu Ling’s last line is so heartbreaking because she sang this song for Meng Jue. I feel so bad for him now…I’m so conflicted because I’m happy that Meng Jue actually opened up a bit with Yun Ge and that they have finally taken a step forward in their relationship. I’m pretty sure the second brother is the boy Liu Fu Ling and Yun Ge saved back when they were children in Xi Yu because that child was looking for his sister who was sold by his parents. I wonder if Meng Jue and Liu He knows that Yun Ge once saved their second brother because I do recall him promising to repay his debt to her someday – now that he is dead I’m assuming his sworn brothers will fulfill his promise for him in some way or another. If Second brother really is Yue Sheng, then he also owed a debt of gratitude to Liu Fu Ling as well. That would be an interesting turn in events if so. Yes he does, but if I recall correctly Liu Fu Ling didn’t tell the him his name at that time, and even if he did he was using a fake name. Hi, Koala unni! I have not been commenting lately on your beautifully translated chapters simply because I have been afraid to pick up YZG, knowing that it’s supposed to end even more tragically than BBJX did, and I literally moped for days after reading BBJX. In the end, though, I could not resist temptation any longer, snuck a peak at one chapter of YZG … And the rest as they say is history. Did anyone else notice the reappearance of the other boy that Yun Ge saved back in Chapter 1? Not Meng Jue but Yue Sheng, the boy that YG and her Ling GeGe saved from the corrupt officials. At least I’m pretty darn sure it’s him; the “looking for his sister” part gave it away for me. In fact, I wonder if his sister will end up coming into play in this story. Hmm, who could she be? Hong Yi? I also wonder how he ended up sworn brothers with an infante. After the mauling that YG received at the hands of those hunting hounds, I felt mildly frustrated that she weren’t more like her mom. Also, what happened to Jin Yu saying that she was going to make all of her kids learn tactics and strategies war manuals? YG is a complete turnaround from her mother, in her naivete and how she always ends up being coddled and protected by other people. If she could be a bit more self-sufficient like her mom, that would be nice. Speaking of HCJ, while I’m glad that Meng Jue stopped being so wishy-washy with regards to YG, I rather wish he’d been smoother in revealing the truth to HCJ. I don’t even want to think what nasty schemes she’s going to be cooking up in retaliation for her broken heart. Who will XPJ be empress to?? In real history LBY becomes an emperor after Ling Gege and Demon spawns 27 day rule. XPJ gets made empress because she’s married to him and was loyal. However, XPJ gets killed off after giving birth by HCJ who they want placed as empress. Goodness my poor head.. Where did you get all these info from? I was totally clueless from d Yue Sheng part to d XPJ being empress part to d HCJ being concubine part!!! Thank you so much Mz. Koala! Again, another well-written chapter by TH. This chapter has to be the best yet! MJ makes a straight-out confession and even chooses YG over Huo Cheng Jun when he informed HCJ that YG is not his sister!!! The descriptions are perfect of him previously sitting/walking beside YG but his heart was a million miles away….until the piggyback ride and their time spent watching the lunar rainbow. And after all that awwwww-inducing sweetness, comes the devastation of Ling gege hearing YG’s song with his ears and his heart only to result in painful silence when it ended. Another missed connection!!! I love TH’s writing that we can feel Ling gege’s genuine longing as he waits with bated breath for YG to come find him and the emptiness he betrays when he wonders for whom she is singing. ACK!!! How much can we take?! omg tong hua is EVIIIIILLLLLL!!!!!!!!! Poor ling gege… GAH Yun Ge! DOn’t forget about him just yet!! Thanks Ms Koala! I haven’t read the chapter yet but I know it will be awesome. To be honest, this book has got me hooked from chapter 1. I find myself going back to re-read chapter 1 again and again, because it is just so enchanting how the writer has set the scene for the events that follow. While I do like DMY, once I started reading YZG, I find myself more drawn to the characters in this story. Could it because the protagonists in DMY are just larger than life whereas the main characters in YZG are more human and therefore, flawed and complex? Well, I must get started on the chapter, which is my treat for the day. Thank you! OMG so close, but so far! Thanks ms K, your very awesome!!! What an ending to this most revealing chapter. Liu Fu Ling’s desperation and longing for Yun Ge while running through the woods was so palpable and bittersweet since she was singing it to Meng Jue. Joy and sorrow two sides of the same coin. Many thanks Ms. Koala, for another beautiful chapter. What a beautiful chapter ! I want it to go on and on …the waiting is exciting and painful at the same time …. Awwwwwwwww. After all these years, LGG is still able to recognize YG’s voice. And how sad is it that she’s actually singing this song for another man and not him. I just feel so bad for him. Looks like YG is falling for MJ. Can she really get over MJ so easily after meeting LGG again? Book 2 can’t come soon enough. I want it now! Thanks for another great update Koala! I’m going to be a little off topic here, but is that a picture of Yuan Hong as Yang Kang in LOCH08? The screenshot seems to be in HD and I was long wondering where to get a 720p copy of LOCH08. Does anyone have an idea? Such heartwrenching scenes. Tong Hua is so good at making me feel completely in love with one character while feeling completely heartbroken for the other. No matter what, someone is always hurt. However, I’d have to admit, I feel that this triangle is more heartwrenching, because while Meng Jiu outshined HQB for Jin Yu’s in DMY, Meng Jue and Liu Fu Ling are on par for Yun Ge’s feeling in YZG—remember, this is just my own personal opinion and feelings. Others can debate. :D.
Anyways, like always, thank you for posting up another wonderful chapter!!!! Agree with you completely. Love the first chapter! Truly charming. can anyone tell me what is the song yun ge is singing? Yun Ge, why didnt you remember his face or voice?! okay, i laughed when Liu He said “Booooring! Back to hunting!” he likes different fun. as I read in this site http://www.amazon.com/Songs-Cloud-Chinese-tong-hua/dp/7506342316 in book description… is it right that yun ge will marry with meng jue to save liu fu ling from his disease?? can anybody tell me, is it true or not…. For anyone who was on the fence about meng jue like me, this chapter was the tie breaker. We never see meng jue so honest, romantic and humane. But lest we jump ship too far, tong hua feel the need to remind us that we need to save a spot for ling ge ge. For me these types of chapter makes me fall in love with the guy more esp one like meng jue who had guarded his heart so tightly. But all I could think about after reading this chapter is ling ge ge. I has always rooted for meng jue from the start because he’s more my kind of hero. Guarded, complex with a painful past. (a bit off tangent here) but they remind me of sleeping beauty. They need a little rescuing, but when you manage to break down their wall, you’ll find an one of a kind of beauty that only belong to you and only you can see. It is getting so good. Thank you Ms. Koala. I gave up studying and read. I think I like this better than DYM. Plus the pictures at the top now are ingrained in my brain, that’s how I think of LFL and MJ. Does it mean Liu He is better than Meng Jue in martial arts? And did.Liu He cause 2nd bro to die ??? ….You knew it was so close, yet you pushed her away! Initially it was all about making a little lady like you, who knew you would lose your heart first…. Yes and Yes to your questions. You will find out soon…. uh…..maybe MJ discovered JY never-ending love for Jin Yu and his sacrifices for HQB…..does MJ want to make Yun Ge love him and make her suffer later on?? Only he never thought that he fell in love with her, too…. Thank you Koala-san…I read this chapter many times…. am dying for the next chapter…….please forgive me, Koala-san….. I believe meng Jue produced yuner’s shoe when he asked for her hand. I am sure jin yu recognized the shoe and that is why parents couldn’treject.